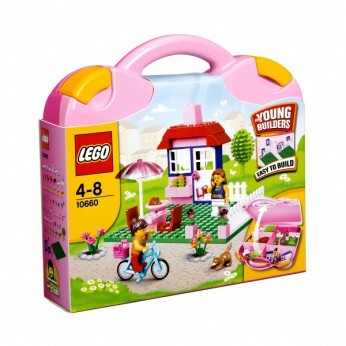 Take the world of creative building everywhere with the LEGO Pink Suitcase! Get building with a cute house theme and tons of bright accessories! All 151 colorful LEGO elements fit into the cool case, complete with a sorting function, that’s easy totake anywhere. Includes 2 minifigures and building instruction booklet with inspirational ideas for even more creative building fun…. Take the world of creative building everywhere with the LEGO Pink Suitcase! Get building with a cute house theme and tons of bright accessories! All 151 colourful LEGO elements fit into the cool case, complete with a sorting function, that’s easy to take anywhere. LEGO model number: 10660: Includes 2 mini figures and building instruction booklet with inspirational ideas for even more creative building fun. One supplied; Size H26.2, W28.5, D6.4cm; Weight 0.08g; For ages 4 years and over; EAN: 5702014972339. WARNING(S): Not suitable for children under 3 years old. To be used under the direct supervision of an adult. This toy costs approximately £19.99 (for the latest and best prices make sure you check our retailer list for the LEGO Pink Suitcase 10660 above). In our review of LEGO Pink Suitcase 10660 we classed it as being suitable for ages 6 years, 7 years, 8 years, 9 years, over 10 years but recommend you check the manufacturer specific advice before purchasing.